WatchDOGS can volunteer to help in their children's classrooms from 1 day a year (shared between each of their children's classes) up to 1 day per half year per child. During the day, WatchDOGS may read and work on flash cards with students, play at recess, eat lunch with students, patrol the school entrances and hallways, assist with traffic flow and any other assigned activities where they actively engage with not only their own students, but other students as well. They may also assist in small group instruction in classrooms, help teachers prepare materials for students, or help students practice newly acquired skills. What is Hillcrest committing to its WatchDOGS? A week before your signed up volunteer date, Hillcrest will remind you of your volunteer date. Hillcrest will also notify your child or children's teachers that you will be volunteering so they can plan for ways you can help in the classroom. Please sign up at least 1 week before the day you would like to volunteer as a Watch DOGS. 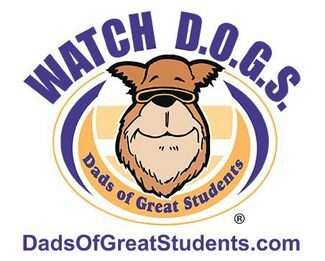 On your WatchDOGS day the school will provide you and your student(s) with a WatchDOGS t-shirt to wear during the school day. What are WatchDOGS committing to? WatchDOGS are committing be present in the school on their volunteer day, they will help their student(s) greet children that day, be present in the classroom helping teachers in the classroom and being a good example to the students that you value their education.